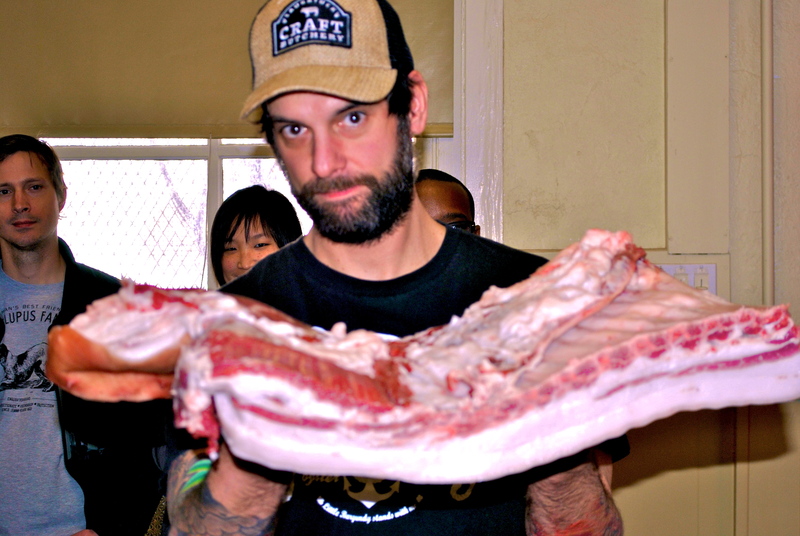 The Greensgrow Community Kitchen at St. Michael’s Lutheran Church recently held an event titled, “Whole Animal Butchering with Bryan Mayer and Michael Pasquarello.” The event was not only educational, but presented some of the ideas behind an exciting new culinary project in Fishtown called B-Side Social Club. No one has arrived yet at St. Michael’s Church, but several rows of chairs have been set up for an audience. A long metal table is positioned before them. A man with a blue apron, tattoos on his arms, and a knife holder hanging by a chain around his waist comes out of the kitchen carrying something with heft, and slams it down on the table. The half pig carcass stretches nearly over the entire surface. The meat settles and becomes flat as he inspects it. He takes out a knife and sharpening stick from the holder on his waist. As he sweeps the knife across the steel, there’s a look of calm concentration on his face. 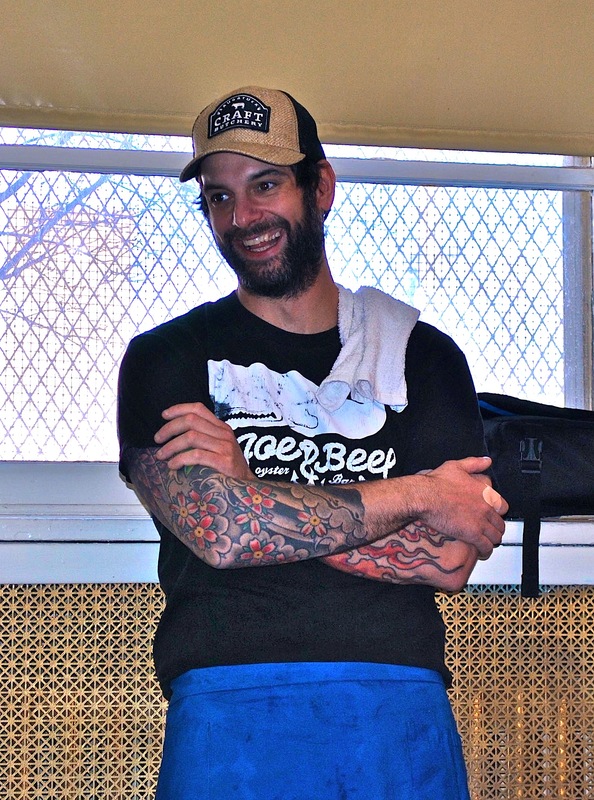 This man is Bryan Mayer, former head butcher at Fleisher’s Grass-Fed and Organic Meats in New York, and previously an Indie-rock musician. He is one of two people hosting the whole animal butchering survey, an event that quickly sold out. Joining Bryan is Michael Pasquarello, owner of a series of restaurants in the Spring Garden neighborhood, including Bufad, Café Lift, and Prohibition Taproom. I had heard that these two were collaborating on a new project in Fishtown called B-Side Social Club, which was going to be a butcher shop, a restaurant, or combination of the two. But details were to be revealed later in the event. People trickle in, take their seats, and soon all the chairs are full. As an introduction, Bryan goes over his variety of knives and their functions. There’s the scabbard, the boning knife, the flex knife, and skinner knife. Each requires a specific handling and type of precision. 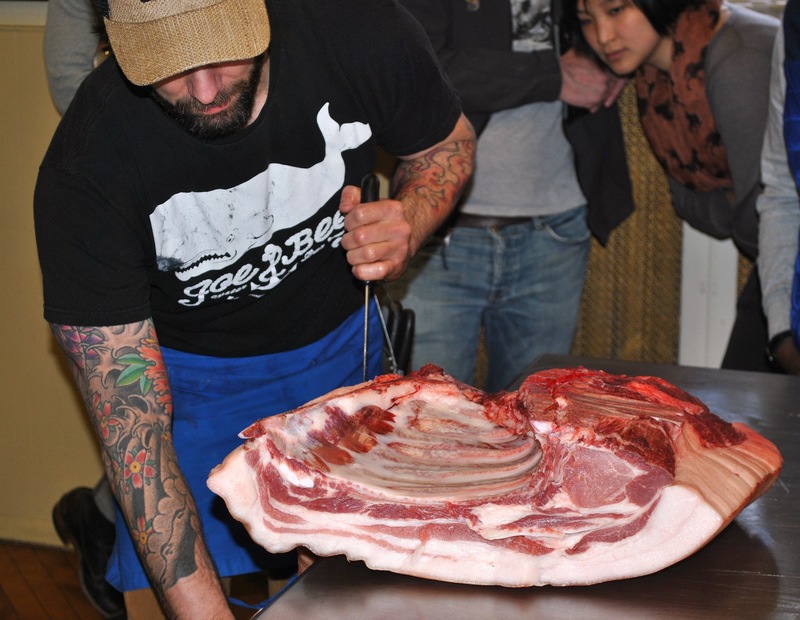 The pig comes from Wyebrook, a 400-acre farm about an hour outside of the city, known for its sustainable practices. Both Michael and Bryan are strong adherents of sustainable farming, a concept that will play a major role in their future Fishtown venue. Before beginning, Bryan states to the audience, “There is an art to all this,” and sharpens his knife for the last few times. First he removes the kidney and lard, mentioning that the kidney can be used for sausages and pâté, and the lard for pie crust. “Pigs are 100% usable,” he says. “There are industries built up around the usage of extra parts that don’t go into a butcher case. Companies pick up the kidneys, skin, glands, and put them in shampoo, lipstick, crayons, beer, candles, everything. It’s virtually impossible if you’re alive in today’s day and age to be a vegetarian.” Several groans arise from the crowd. The first major cut he focuses on is the tenderloin. He works carefully like a surgeon, separating muscle and bone. He demonstrates the principles of “seam” cutting as he follows the line of the muscle and begins to remove what resembles a tenderloin. Seam cutting is a European method used for charcuterie, preservation, and curing. This contrasts with the American “box” procedure, which cuts across the animal and gives less attention to the muscle structure. Bryan likes to employ a hybrid style, separating the animal with the box method, then seaming out the various parts. As Bryan moves to the flank, shoulder, and belly, he reveals an expert knowledge of the animal’s anatomy, knowing exactly where and how to cut. He explains the culinary possibilities for each part, and the necessity of forethought in apportioning whole animals for a menu. It’s easy for a restaurant to call up a meat purveyor and order a box of ready-to-go porkchops. But that’s not the case when working with whole, sustainably raised animals. Bryan brings up the example of St. Louis ribs, which are big and meaty, but take away belly meat that can be used for bacon or porkchops. For a butcher, the animal’s body is a system with limited materials, and it is his job to make the right choices and economize efficiently. “I never toss things out,” he says. Bryan finishes with the belly, and holds it up for everyone to see. People whip out their iPhones and snap picture after picture. 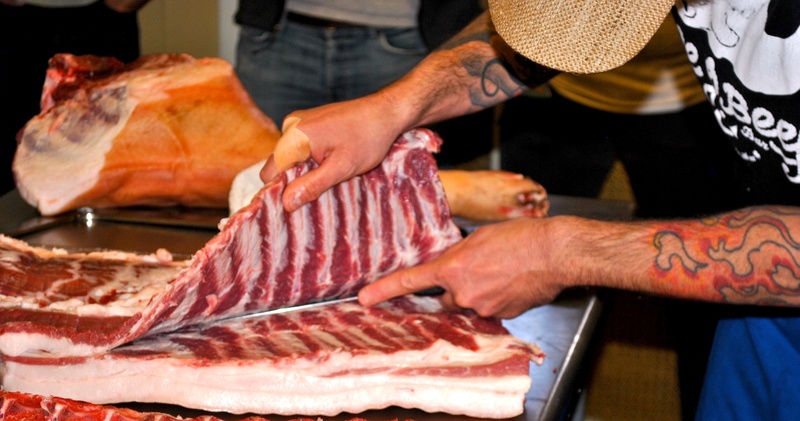 The demonstration lasts two hours, and he completes four primal cuts of the pig: the loin, shoulder, belly, and ham. To finish, he does long, clean cuts underneath the ribs, and pulls them off the belly. The pig has been completely deconstructed. At this time, Bradford, Greensgrow’s kitchen supervisor and the organizer of the event, says that it’s time to wrap up. At 2:00 there’s a birthday party for an eight-year old girl. Pink balloons, colorful pointy hats, and a Hello Kitty birthday cake are being placed on a table not far from the pig parts. Cleaning needs to commence quickly before they arrive. Bradford mentions a few of the upcoming events at the Community Kitchen. On April 27th, Chef Carolyn Angle from Standard Tap will be presenting a workshop on ceviche and escabeche. If you come to any of the exciting events at the Kitchen, and see someone taking lots of photographs, that’ll be me. Part of the purpose of the butchering survey was to begin raising awareness about a new project in Fishtown, B-Side Social club. This creation represents some innovative ideas. It will be more than just a restaurant. Bradford gives the floor to Bryan and Michael to answer questions, and they reveal that the full name of the venue will be, “B-Side Social Club: Butchery and Beer,” and that it will be right next to Bottle Bar East on Frankford Avenue. Thanks to Michael’s network of restaurants, no leftovers from the butchershop will go to waste. Some may go to the burger grind at Prohibition Taproom, or the sausage for pizza at Bufad. This is a smart, logical system that will help eliminate concern for profitability, and allow the sustainable butchery concept to flourish. 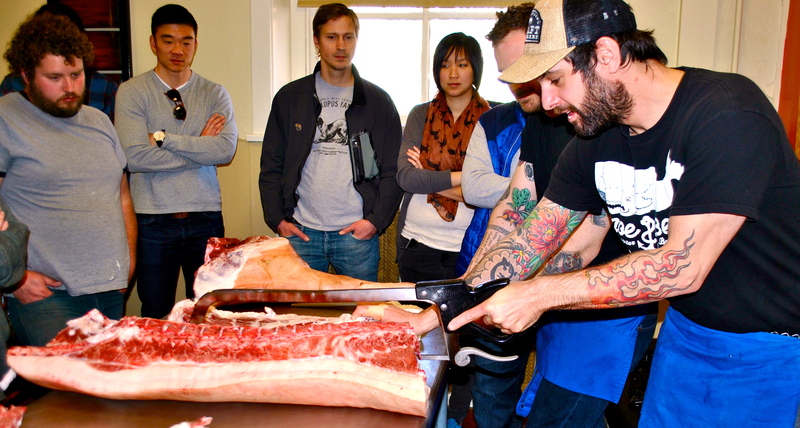 Sustainable butchery is not only simple, but creates more humanity in the meat industry. Animals are treated well, and relationships build between people—between the farmer and butcher, and the butcher and his customers. B-Side Social Club is part of a food movement meant to benefit the local economy, and it is being reinforced by the increasing number of like-minded businesses in Philadelphia that practice sustainability. “We all have to find ways to work together to make sure these ideas grow,” Bryan says at the end. 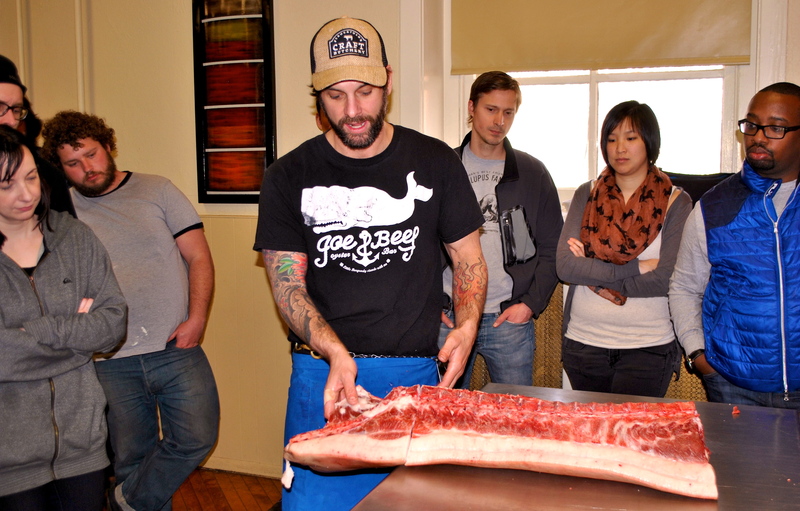 “No man is an island, entire of itself.” Sustainable butchery is a progressive idea that will help change the food industry, and one of the seeds is being planted right here in Fishtown. Click here to see more Fishtown Spotlights interviews. Like Fishtown Spotlights on Facebook. Follow Fishtown Spotlights on Twitter. NEW: Fishtown Spotlights is now on Instagram! This entry was posted in Categories, Events, Food & Drink and tagged b-side social club, brian mayer, fishtown food, Fleisher's, greensgrow, michael pasquarello, philadelphia, prohibition taproom, sustainable butcher, wyebrook by fishtownspotlights. Bookmark the permalink.